Kei Iwaki’s Farewell, My Orange (translated by Meredith McKinney, review copy courtesy of Europa Editions) is set in the small (imaginary) town of Port Griffin, located somewhere on the coast in the southern part of Australia. One half of the novel takes the form of letters from a Japanese woman, Sayuri, to her old ESL teacher, describing life in her new home and the people she has met. Her reason for coming to Australia is her husband’s work at a small Australian university, and she must get through her days as best she can while caring for her young daughter. However, the other half of the story features the life of a very different migrant. Salimah has finally reached safety after fleeing from violence in her African homeland, but life in Australia is not quite what she imagined. Neglected by her husband and disturbed by the stares she receives in her new home, she decides to make the best of things by taking up a job in a meat-processing factory and, eventually, deciding to study English, too. It’s here that she starts to make friends with fellow migrants – including a certain Japanese woman. I’d always just arrogantly assumed I knew it, without ever really trying to come to grips with it. It was dishonest. How much I’ve realised by learning a foreign language! You learn how to speak and hear, in other words you learn the sounds of a language, through the realities of everyday social life, and it’s seared into your ears and tongue forever, most especially through being associated with strong associations like mental and physical joy and pain. Little does Sayuri know that her words are prescient – shortly after this letter to her teacher she is to experience an event that will shake her to the core, and in a foreign land, too. For the most part, though, Sayuri is actually a minor character in the background of Salimah’s story (where she is given the nickname Echidna for her spiky-looking hair). Where the Japanese woman is a fairly privileged migrant, Salimah is a very different kind of foreigner, a dark-skinned refugee in a small town with a relatively homogeneous population. She doesn’t really suffer from any active discrimination, yet the surprised looks she receives on the street from those unused to seeing black people make her uncomfortable. To make things worse, her family, which you’d expect to be her sanctuary, is anything but. Her husband has already shot through by the start of the book, and her sons, having picked up the language with ease, now mock their virtually illiterate mother. Perhaps the word weirdo indicated someone excluded from the group. But she herself hadn’t been born and bred in this group. I’m different – she said it aloud. There are many books that deal with the immigrant experience, but one notable feature of Farewell, My Orange is its focus on women from different cultures. As well as Salimah’s experience of starting out from rock-bottom and Sayuri’s lonely life with a young child and a busy husband, Iwaki introduces Paola, a long-term Italian-born resident with very different issues. Married to a loving Australian husband, you’d think her life would be much easier, yet despite having been here for decades, she has never truly settled, missing the country and family she left behind. It doesn’t take a genius to realise that one of Iwaki’s solutions to the problems raised by migration is the creation of a new kind of family, a multi-cultural group of friends to turn to in times of trouble. Before I finish today, let me return to the comment I made in the first paragraph. 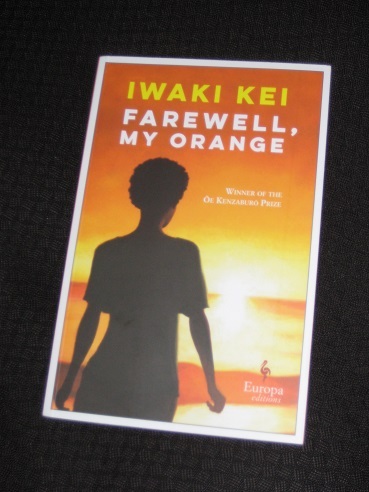 Farewell, My Orange interested me from the start because of the personal connection I had with the story (surprisingly, *not* the Japanese strand). You see, while I’ve spent most of my life in Australia teaching English to students hoping to study at a major university, there was a four-year period where I took a bit of a break and worked instead at a neighbourhood house, a kind of community center offering both lifestyle classes and more academic courses. The centre was located on the edge of Melbourne, so while still technically part of the big city, it actually had more of a small-town feel. When I started, there was only one class for ESL, although the manager was kind enough to allow us to split the class for two of the four days each week, and I have vivid memories of attempting to balance the needs of Europeans with fairly fluent English and the demands of elderly African ladies who had never had any formal schooling before. It wasn’t always easy, but the community atmosphere here was wonderful, with students often becoming close friends and meeting up outside class. Iwaki’s book doesn’t really go into details about the harsher realities of migrant life (it’s a story – in a double sense – and Salimah represents the successful migrant). Many of the women I taught had serious health issues arising from the years of living in camps, and few ever managed to improve their English to the extent that they could work as Salimah does. However, it’s still a useful reminder that not everyone that comes to a new country can simply settle down for a comfortable life of sponging off the government. There’s usually a reason why they came here, and it’s the responsibility of wealthy countries to help those in need. I read this book yesterday and thought it was a compelling novel. Iwaki incorporates a variety of experiences with dynamic characters, briefly and profoundly. Also recently read “T. Singer” and “Naked Men” – very different stories but both compulsively readable. I read this book this afternoon, I thought it was an interesting and compassionate novel reflecting the immigrant experience in Australia, a perspective not always reflected in the mainstream media. I bought this book in Perth, Australia but as you say it was imported under Europa titles, definitely hope it gets the readership it deserves! Cheryl – It would be great for it to be MBIP longlisted, if only for that reason. I don’t know if anyone is planning to pick up the Australian rights for it (as Text, for example, did with another Europa writer, Elena Ferrante…), but it would be a nice idea. I must confess to enjoying the contemporary pieces of Japanese fiction even more than the classics. (Truthfully, The Temple of The Golden Pavilion bored me a little bit until I saw it in real life.) Europa Editions so rarely disappoints with what they publish. Have you read The Nakano Gift Shop? Bellezza – Yes, I’ve read and reviewed that, one of four of hers that I’ve tried (another is coming out later this year).